As a Junior Professional, I have gained a network both internally in the company, but also externally as I have met many different customers along the way. Internally, I have gained a network of experienced consultants, which has been highly essential for the improvement of my development as a consultant. You will sometimes face projects or meet challenges that go beyond your main competences in SAP. For instance, in my latest project I worked within the area of master data. Master data is not a part of my main competences, however the project introduced me to a new interesting area, as well as colleagues with other competences than my own. Whether you work on the same project or not, your internal network can be highly important as you might face issues where you need their help. I have only experienced friendly colleagues, who are all willing to take their time to provide me with good advice. At itelligence, we are also a network of Junior Professionals. The relationship between all Junior Professionals is very good and informal, and we often meet for social activities. Once or twice a week I work together with another Junior Professional, but even if we work on separate projects, we can still share our problems, discuss our solutions and solve the projects together. Externally, you will as a consultant also gain a great network as you get in touch with many people that you would not be able to reach in an internal position. Both internal and external networks enrich my experience and help me on my path. I am learning every day and three key learnings stands out: working methodically, working in teams, and documenting the process and results. For those of you planning to start your career within consulting, I advise you to read these three key learnings carefully. They were important to me as a Junior Professional and I hope you will find them valuable, too. Working methodically and structured is a key skill as a consultant. You need to be professional in everything you do. The method used during the project will affect the customers’ view on the project, but also on you as a consultant. You always need to be well prepared in regard to your customer and structure your work in every task you undertake. Make sure there is alignment between what you as consultant expect and what the customer expects, both in terms of format, deliveries, and deadlines. This is something you need to be aware of as a consultant, but also in your future career. Being a team player is a key skill in project work. It is not expected that you are an expert in every area, but use your network or colleagues for a professional discussion about the challenges you meet along the way, and share your experience with others. As a consultant, you are selling knowledge to your customers. My experience is that documentation is highly important in this regard. Make sure the things you learn, the solutions you create, or the problems you face, are well-documented. Documentation could either be a short solution guide with screen dumps, or an excel sheet of a problem you faced in the system and how you solved it. As a consultant, you will often meet the same challenges several times, and there is high possibility that you will need this documentation in the future. I am still happy that I chose to leave my base in Copenhagen and move to Jutland. itelligence Academy has proven to be the right choice for me. First, I have learned how to work as a consultant and as a team player. Secondly, I have gained a network of resources. Lastly, I have learned the importance of documenting the process and results of my work. I want to thank itelligence Nordic for allowing me to acquire these keys learnings, and I am looking forward to the future journey and the experiences it will bring. 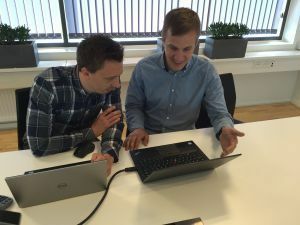 “itelligence Nordic is one of the leading international full-service providers of SAP solutions, which both support and implement SAP to more than 500 customers world-wide. itelligence Academy is a two year program where the participants develop Junior Professionals to experienced consultants. Coaching from experienced consultant to support the Junior Professional is a key factor in the career development from junior to consultants”.